Every New Mexican&apos;s favorite ingredient—chile, of course—isn&apos;t just for traditional main courses. It also appears in soups, salads, and desserts. Here are a few of our favorite recipes from the archives. 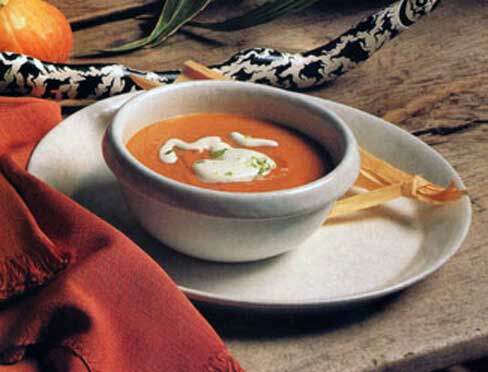 Place the peeled pumpkin pieces and bay leaves in a large heavy pot or Dutch oven. Pour enough water to completely cover the pumpkin. Cover the pot, bring to a boil, reduce the heat to medium and cook for 45 minutes or until the pumpkin is soft. Drain the pumpkin, remove the bay leaves. Let the pumpkin cool and reserve. Heat oil in a heavy soup pot, add the onion and cook over low heat for 3-4 minutes or until just soft, add the garlic and parsley and cook another 1-2 minutes. Place the pumpkin, in 2 or 3 batches in a blender or food processor. Add a little of the chicken broth each time and blend until smooth. Add the onion, garlic and chile flakes to the last batch. Pour the mixture back into the soup pot, add the rest of the chicken broth, salt, pepper, allspice and chocolate and cook over low heat, stirring occasionally, until warmed through. Place the chocolate, whipping cream and chile in a heavy saucepan. Stir over low heat until chocolate has melted and the mixture is thoroughly blended. Chill mixture until firm, at least 2 to 3 hours. Scoop out rounded teaspoonfuls of chocolate mixture. Try using a melon baller; this produces round, professional-looking truffles. 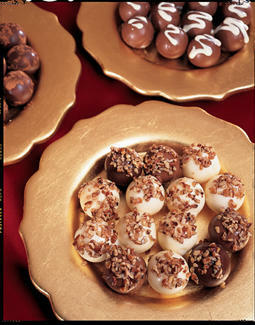 Roll in cocoa, place on platter and return to refrigerator. This light, beautiful salad gives color to the table. It’s very tangy and serves as a palette refresher for the heavier, traditional foods. If oranges aren’t fresh, substitute manda­rin oranges. Spoon the salad on a butter let­tuce leaf and serve with tortilla tri­angles. In a mixing bowl combine the rice vinegar, fresh ginger, orange juice and red chile. Slowly whisk the olive oil into the mixture until it is incorporated. This mixture can be refrigerated for about 1 week. Toss the fruit with the vinaigrette. 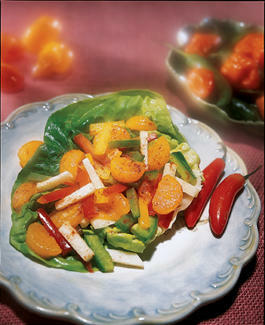 Place about 1/2 cup of the fruit mixture into the lettuce leaf. Sprinkle with red chile powder if desired. 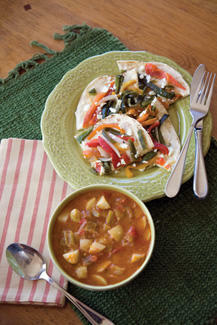 You’ll enjoy this hearty, easy-to-make, New Mexico-style vegetable soup. to prevent burning. Add garlic and cook 2 minutes. Add tomatoes and cook 3 more minutes, stirring to prevent burning. Add green chile and cook another 2 minutes. Add potatoes, water, salt, black pepper, and red-chile powder. Stir. Bring to boil, then reduce heat and simmer 25 minutes, stirring occasionally until potatoes are soft. Remove from heat and serve immediately. Boil water and crushed chiles together in small saucepan until chile flesh is soft. Strain, rubbing with wooden spoon or rubber spatula to remove as much pulp as possible. Return mixture to saucepan, add ¹/³ cup of sugar and cinnamon sticks. Boil 1 minute, then remove from heat and let stand 1 minute. Discard cinnamon sticks, add chocolate and butter. Let stand several minutes, until chocolate is melted. Stir mixture until smooth. If necessary, place over low heat until chocolate melts. Scald cream in large saucepan. In bowl, beat egg yolks with remaining ¹/³ cup sugar until thick and lemon-colored. Beat in a little of the cream, and return mixture to saucepan. Cook, stirring until mixture is hot, then remove from heat. Beat in chocolate mixture and remaining cream. Pour into heatproof bowl. Refrigerate until chilled, stirring occasionally. 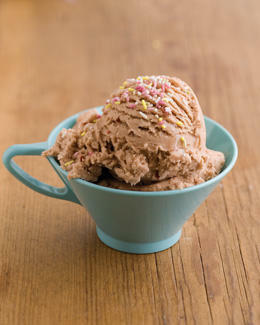 Transfer to ice-cream maker and freeze according to manufacturer’s directions. Recipe developed by Jane Butel, founder of the Jane Butel Cooking School. Reprinted with permission.